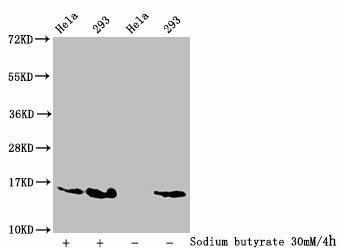 Western blot analysis of extracts from 293 cells untreated or treated with serum using FKHR(Phospho-Ser256) Antibody. 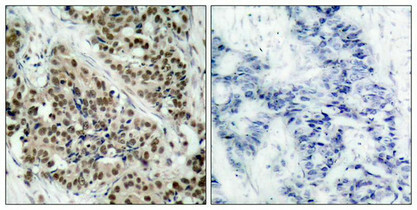 Immunohistochemical analysis of paraffin-embedded human breast carcinoma tissue using FKHR (Phospho-Ser256) Antibody (left) or the same antibody preincubated with blocking peptide (right). 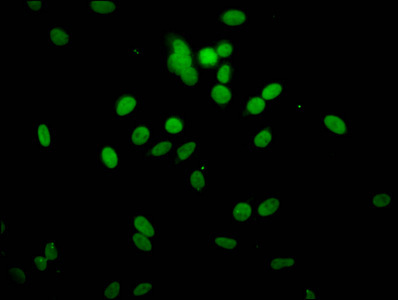 Immunofluorescence staining of methanol-fixed MCF7 cells using FKHR(Phospho-Ser256) Antibody. 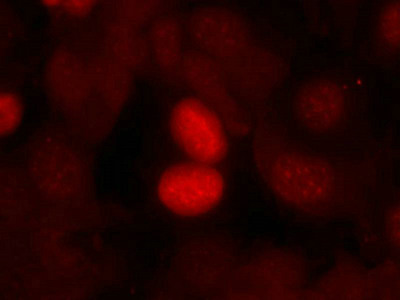 Immunofluorescence staining of methanol-fixed MEF cells untreated or treated with LY2904 using FKHR (Phospho-Ser256) Antibody. Immunogen Peptide sequence around phosphorylation site of serine 256 (A-A-S(p)-M-D) derived from Human FKHR. 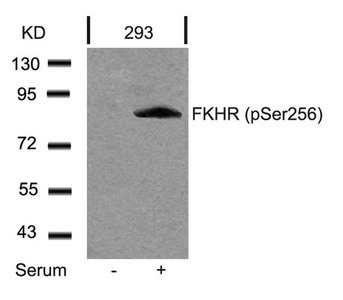 Specificity The antibody detects endogenous level of FKHR only when phosphorylated at serine 256. 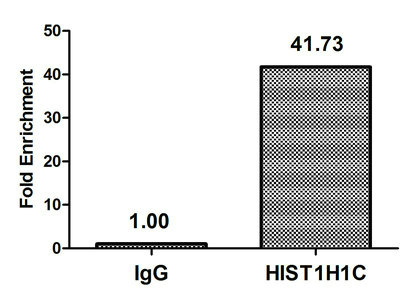 Transcription factor that is the main target of insulin signaling and regulates metabolic homeostasis in response to oxidative stress. Binds to the insulin response element (IRE) with consensus sequence 5'-TT[G/A]TTTTG-3' and the related Daf-16 family binding element (DBE) with consensus sequence 5'-TT[G/A]TTTAC-3'. 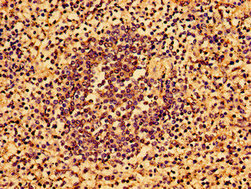 Activity suppressed by insulin. Main regulator of redox balance and osteoblast numbers and controls bone mass. 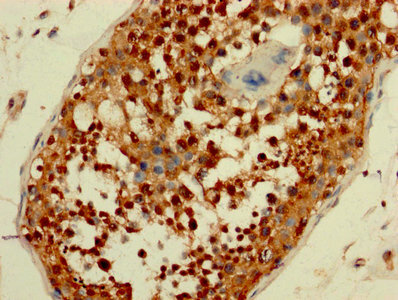 Orchestrates the endocrine function of the skeleton in regulating glucose metabolism. Acts syngernistically with ATF4 to suppress osteocalcin/BGLAP activity, increasing glucose levels and triggering glucose intolerance and insulin insensitivity. Also suppresses the transcriptional activity of RUNX2, an upstream activator of osteocalcin/BGLAP. 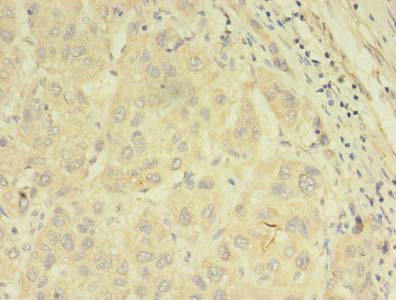 In hepatocytes, promotes gluconeogenesis by acting together with PPARGC1A to activate the expression of genes such as IGFBP1, G6PC and PPCK1. 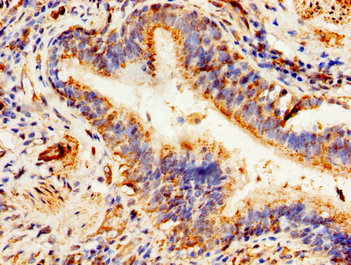 Important regulator of cell death acting downstream of CDK1, PKB/AKT1 and SKT4/MST1. Promotes neural cell death. Mediates insulin action on adipose. Regulates the expression of adipogenic genes such as PPARG during preadipocyte differentiation and, adipocyte size and adipose tissue-specific gene expression in response to excessive calorie intake. 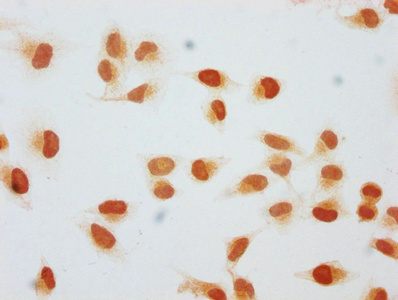 Regulates the transcriptional activity of GADD45A and repair of nitric oxide-damaged DNA in beta-cells.